At the beginning of January, in the depths of winter, Collectif optimistically flooded their social media with pictures of Spring and Summer finery. The models shrugged of furs and velvet in favour of floral prints, mariner basics and pastel tones. At the time I was overwhelmed by the sheer wonderousness of the choices, but Spring and cheerful colours seemed so far enough. Now we are nearing the warmer seasons and I have had a little time to digest the collection below are my very top favourites. 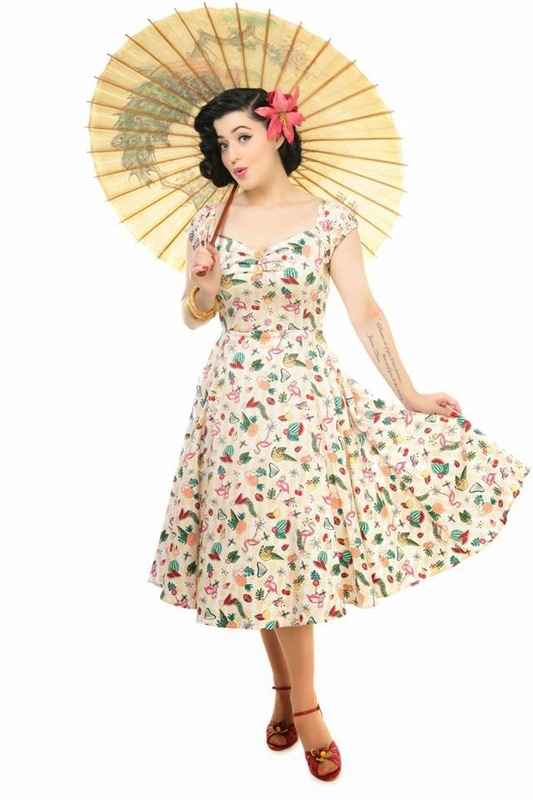 My first ever purchase from Collectif was the navy polka dot Dolores doll dress. I now have six. Yip. Six. And I continue to add to this collection every season. So in Spring/Summer ideally I would like one (or both) of these. I am not really one for beige bases generally - it does nothing for my fair skin and colouring. But there are flamingos on this! I LOVE flamingos! They are so charmingly tacky (despite the birds themselves being quite lovely) and 70s. So because of the darling flamingos, and the fact that there are so many gorgeous colours in this print to chose from, with the right accessories I know the beige wouldn't be a problem. I love the idea of adding a colourful belt and some cork wedges and a big, bright hairflower. Perfect for a barbeque or picnic! At the moment I am also all about pineapples - they are pretty to look out, and there is something inexplicably cute about them (just me? okay then...). The colours they have chosen for this pineapple print Dolores are great. I am a huge fan of green as it goes so well with red hair, so this one if definitely on my shopping list. This is the perfect beach holiday, or summers day out dress. You may have noticed I am a sucker for red, and I love a good swing dress. Enter the Colette... Perfection! Nice full swing skirt, lovely halterneck to show off shoulders and back in the summer sun, and that peephole! There is something so cute and yet slightly risque about it. And it really works on a sundress, and makes this lovely style just a little more exciting. I am not sure how this dress would work with a bra (as I wouldn't want mine, strapless or halterneck) peering out out of the peep hole. But will just have to wait on that one. Other than that - Love it! Come summer I love a maxi dress, and it is particularly hard to find ones with sleeves that don't look totally mumsy. Well this one is a total winner! Sophisticated, stripey (always gets my vote), vintage-y. And that long black skirt going from an empire bust line is going to draw the eye down making the wearer look super tall. Sigh. Get in my closet now! Swimwear. Meh! I love to swim. I am definitely a mermaid (and not just because of the Ariel like tresses!) and I can spend hours in the sea practicing underwater roly-polies, and perfecting my Ariel hair flick. But the swimsuit options for plus sized gals - ick! I do not want a swimsuit with a skirt, I do not want a burkini. While my swimsuit will never be up there with my favourite items, it would be great if I actually liked it, rather than just settling for the one that fits. (Which pretty much all of them have been up until now) So this Lottie number is pretty much perfect. Love the colour (I will look like the before shot in those stupid Special K ads) love the cut, love the vintage asthetic. Yay! My big trip over the year is to the States. This summer I am heading to Minnesota, to my cousin's wedding and I am already auditioning dresses for the big event. The front runner at the moment is this Sophie Occasion swing dress. I love navy - it is slightly less harsh than black on my pale complexion, it goes well with my hair, and is a great base colour. This could be worn with any combination of accent colours - green, red, pink, white, gold, sliver. I adore the sleeves, and the soft layers make it feel like a truly vintage piece. Perfect romantic wear for a wedding. So those are my top picks. By no means the only things I would chose if I got free reign in the gorgeous Collectif store, but my faves for the moment. Looking forward to reviewing some of these in the Spring / Summer - come on sun!